The tradition was started with Walt Disney's original Disneyland: the castle would be elegant and beautiful from the back as well as the front. Though Sleeping Beauty Castle happened by accident (per Disney legend, Imagineers once accidentally flipped the top half of the model around, but Walt liked it so much that he declared it should stay that way), the castles that have sprung up at Magic Kingdoms around the world since have carried the trend of paying as much attention on the rear facade as the main one. 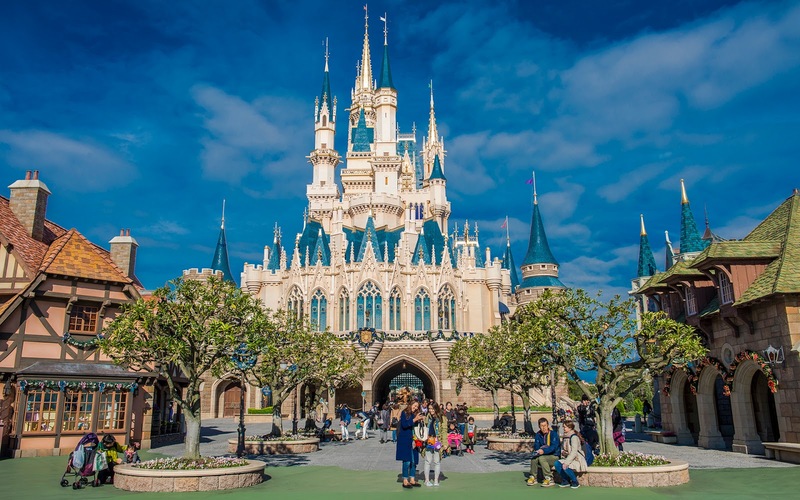 So in Tokyo Disneyland, Cinderella Castle gets similar treatment. Granted, this is nearly identical to Walt Disney World's version, but hey, it's nice to see things be consistent! Cinderella Castle from the Tokyo Fantasyland side.